Pakistan’s top property website Zameen.com has signed a Memorandum of Understanding (MoU) with Defence Housing Authority (DHA) Lahore, in which both organisations have agreed in principle that Zameen.com will organize the DHA Property Festival 2015. This is the first time the DHA has ever collaborated with a private organisation to hold an event of this kind. 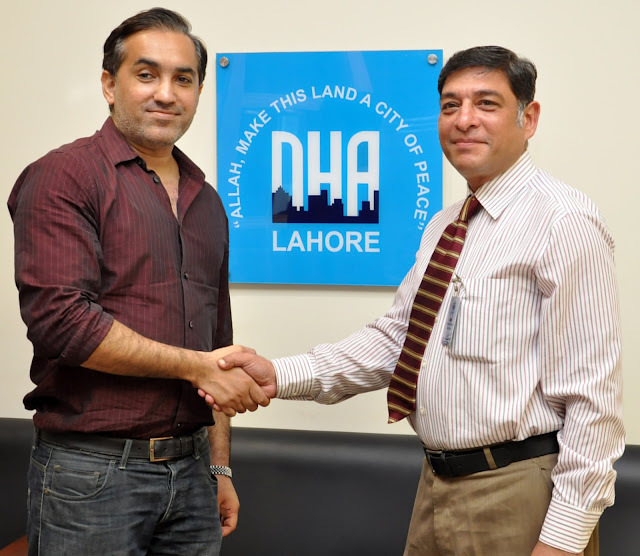 The MoU was signed at DHA Lahore’s Main Office Complex in Phase VI recently. Zameen.com CEO Zeeshan Ali Khan signed on behalf of the portal, while Additional Director Marketing Ahmed Arif Makhdumi signed on behalf of DHA, Pakistan’s premier real estate developer. DHA Property Festival 2015 is a family-focused event to be held in DHA Phase V on August 29th and 30th, which will feature top real estate agents from around the city who deal in DHA properties. The event will bring together top real estate investors from the region and genuine buyers looking for properties in DHA, as well as their families for two days of fun, food, music and the real estate deals of a lifetime. The DHA will also showcase its latest projects at the event. Zameen.com is the country’s first and largest real estate website with 1.5 million monthly visits, 7,000 agencies and upwards of 500,000 members. It features more than 1.3 million authentic property listings from around the country.